Johnson, Derek, Linda Kershaw, Andy MacKinnon, Jim Pojar. 1995. 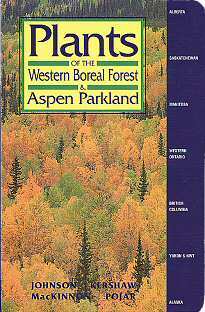 Plants of the Western Boreal Forest and Aspen Parkland. Lone Pine Publishing, Edmonton and Vancouver, Canada and Renton, Washington. Paperback. 392 pgs. This guide shares authors with Plants of the Pacific Northwest Coast and was also published by Lone Pine Publishing. It has the same excellent format, some of the same photographs, and also features plant uses of the Aboriginal people of the area. It does not have individual species distribution maps. However, this guide focuses on the eastern side of the coastal mountain ranges and includes the Western Boreal Forest from tree line near the arctic circle in Alaska and western Canada south to the begining of the grasslands in southern Canada. An excellent guide for the Northwest and Alaskan flora.